If Martin Luther was correct and wine is indeed “made by God”, Tasmanians may have some basis for their frequent assertion that their island is “God’s own”. The state is in the grip of an unpreceden­ted wine boom, with production projected to triple in just five years and vineyards rapidly replacing paddocks in valleys from the Tamar in the north to the Coal River in the south. “It is happening at a feverish pace — we’ve seen vineyard plantings grow by more than 25 per cent over the past five years,” explained Wine Tasmania chief executive officer Sheralee Davies. The addition of 500 hectares of vines in that period has brought the state’s overall vineyard estate to 1880ha, with a further 100ha being added this season and another­ 150ha already planned for next season. “We are talking very significant growth,” Ms Davies said. Unlike mistakes made nationally that have led to boom and bust in the wine industry, this growth is not speculative but rather­ a response to existing, growing demand. Tasmania has invested in wine marketing and market development, just as its reputation has grown and the Australian palate has come around to its trademark sparkling and other cool-climate wines. Yearly vintages can vary greatly due to the weather, but Tasmania’s annual average produc­tion is well on its way to trebling, from 500,000 12-bottle cases a year in 2015 to 1.5 million by 2020. Mainland producers have seen an opportunity, buying up local vineyards; with Shaw and Smith, Treasury Wine Estates and Hill-Smith Estate all following the Tasmanian trend set by Brown Brothers. Chinese investors are circling too, although only one vineyard has so far been purchased by China-based interests. The productivity of smaller, established local operations is also improving, with the benefit of 30 years of trial and error. The fledgling industry of the pioneers is now a $200 million trade. James Halliday, one of the natio­n’s leading wine connoisseurs, recently included eight Australian labels in his top 20 sparkling wines, of which a staggerin­g six were Tasmanian: three from House of Arras, as well as Bay of Fires, Pirie Traditional Method (Brown Brothers) and Clover Hill. The Clover Hill sparkling rose is from one of the state’s oldest vineyards, at Pipers River in Tasmania’s north. It was established in 1986 by the Goelet family — descendan­ts of the Guestier wine merchant family of Bordeaux. 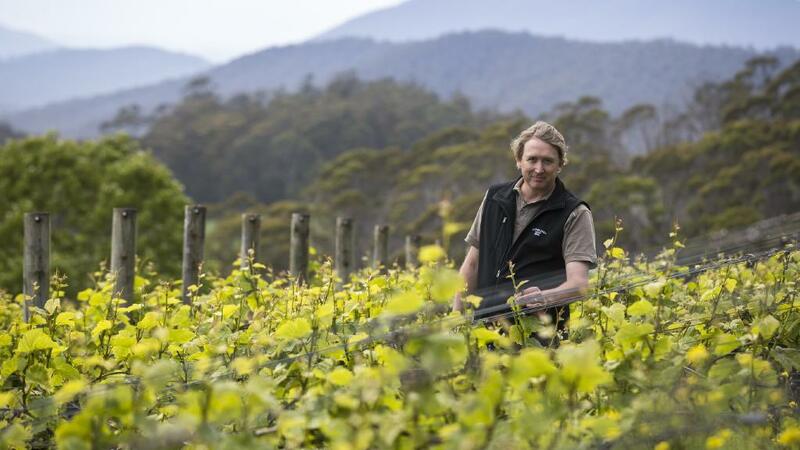 Clover Hill vineyard manager Matthew Cox said the micro-clim­ates caused by Tasmania’s proximity to water and wide range of slopes and peaks, even within individual vineyards, creat­ed a complexity coveted by winemakers and connoisseurs. “We have some particularly entertaining slopes here that really do give each site individuality,” Mr Cox said. The label’s chief winemaker, Robert Heywood, said Tasmania’s cool summers — producing longer ripening periods — were “perfect” for producing sparkling wines. While only about 10 per cent of Tasmanian wine is sold overseas — chiefly to Britain, China and the US — its growing reputation and premium pitch means many export markets are untapped.